Walla Walla, WA - He's just 17 and already has helped save another teen's life. Colby Turner learned lifesaving skills to work as a lifeguard at the YMCA of Walla Walla. He didn't know they would come in handy on the high school track team. Junior Jacob Pribilsky had just finished his 400-meter race at the Blue Devils Legends Invite and was having trouble breathing. That's when Turner came over to help. "He sat up on his own and said he felt better," Turner said. "His dad (Jason) was asking him questions, but he wasn't able to answer all of them. "He fell back, but it didn't register at first what was happening," he said. When the 17-year-old Pribilsky started seizing, Turner rolled him to his side and called for athletic trainer Kelsey Dill. "Once he stopped seizing, there was no pulse," Dill said. "Colby started compressions and I went to get the AED (automated external defibrillator). There was no down time for Jake. We had compressions immediately, and I had the AED on him within a minute." Dill and Turner also got an assist from Drs. Jon Gardner and Byron Miller, and Brad Morris, EMS supervisor with the Walla Walla Fire Department, who were at the meet. They were able to revive Pribilsky, who was whisked away by ambulance to St. Mary Medical Center, and later transferred to Sacred Heart Medical Center in Spokane. Pribilsky's incident April 21 was the second this school year in Eastern Washington and the second to raise awareness for the need for portable defibrillators at student athletic events. Central Valley High School football player Brandon Snider went into cardiac arrest during a game in Spokane in October. Athletic trainer Jeff Morrison and two firefighters quickly jumped into action, doing compressions and using a portable defibrillator to get Snider's heart beating again. Doctors said Snider would not have survived if not for the early compressions and the use of the AED. Sudden cardiac arrest is the No. 1 cause of death among young athletes. While doctors and EMS personnel face life-and-death situations daily, teenagers do not. Turner's quick actions and knowledge impressed Dill. "It was really incredible to watch this young person react and perform the way he did," Dill said. "We have an emergency action plan in place, and we have had some things happen, but nothing life-or-death like that moment." Turner also drew praise from Walla Walla track coach Eric Hisaw. "For a kid who is just 17, Colby just jumped right in and started compressions," Hisaw said. "The whole venue was ghost-town silent. For our trainer, Colby and the doctors to do what they did was amazing. "We paused the meet for about 15 minutes. We talked to our kids about what was going on. There were a lot of scared kids." While all schools are required to have automated defibrillators, not all schools are required to have an athletic trainer. "You count your blessings for people like Kelsey (Dill)," Hisaw said. "Athletic trainers don't get enough praise. They are amazing people. There is such a need for them. They are vitally important. They do what they can until a doctor can get there." Dill, who has been at Wa-Hi for four years, said only 37 percent of high schools nationwide employ a full-time athletic trainer. Hawaii mandates that all high schools have one. California, on the other hand, does not require trainers to be certified. Dill does not leave her office without an automated defibrillator in her red bag, which also includes air splints and other necessary items. 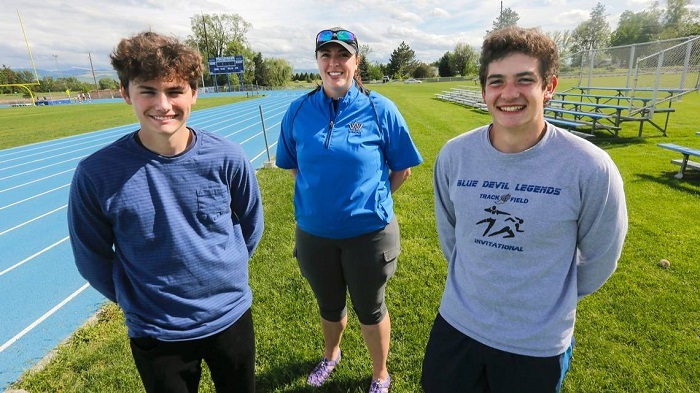 "Had I not had one with me, the closest one would have been in the school behind a locked door," said Dill, who noted that there also is an AED in the main gym and at Murr Field, where the Blue Devils play baseball. "We would not have been able to get it in time." Hisaw said he received a call from a coach at another Tri-City high school that doesn't have AEDs at or near athletic fields. The coach said if the same thing happened there, the kid probably would have died. An AED checks the heart rhythm and can send an electric shock to the heart to try to restore a normal beat. The machines cost $1,200 to $1,800, but Hisaw said, "You can't put a price tag on them." Once the machine is open, it talks to the user and walks them through the correct procedure to shock the heart. "They are made so that anyone can use them," Dill said. The Kennewick School District is in the process of buying more AEDs, which will be used at outdoor athletic activities at Kamiakin High School and at Horse Heaven Hills, Highlands and Park middle schools. The additional AEDs, which cost $1,350 each, bring the district's total to 60. At Pasco High School, there are two AEDs in the main building, one at Edgar Brown Stadium, and athletic trainer Ashley Lindberry has one with her at every sporting event. At Hanford, there are three in the main building, and athletic trainer Matthew Gray carries one with him at all times, whether it be a practice or an event. Other schools also are equipped with some of the devices. Pribilsky's mom, Suzanne Morrissey, said her son suffered ventricular arrhythmia. During surgery, doctors implanted a cardioverter defibrillator in his chest, which will shock his heart if he were to experience another cardiac arrest. He spent about a week at Sacred Heart in Spokane. He since has returned to school. "We are all still trying to recover," Morrissey said. "I am still emotionally raw. All the people who were there, and our community, are amazing." Turner, also a junior, competed later that day in the 800-meter race, but it was not his best day. "I was still a little shaken up," said Turner, who plans to go to medical school to be trauma surgeon.